Frankfurters take their sauce very seriously. They even founded a Frankfurter green sauce protection club and patented the name of the dish. According to them, at leat 70 percent of the herb mixture must be from the Frankfurt region and should consist of chives, borage, pimpinella, chervil, sorrel, parsley and cress. If you don’t care much about the original, you could also use any other herb alternatively though. In the end, which herbs make it into the sauce depends on the chefs taste or simply on what’s available. 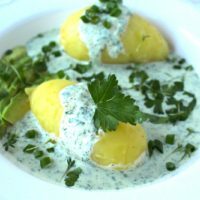 I got to know this dish when I lived in Frankfurt – actually very close to where those herbs are cultivated – for half a year. In Hessia you can buy the herb mixture in the exact ratio at the weekly markets. Outside of Frankfurt it can be a little tricky to find all the herbs, but you can always get them separately or even use other herbs of your choice. 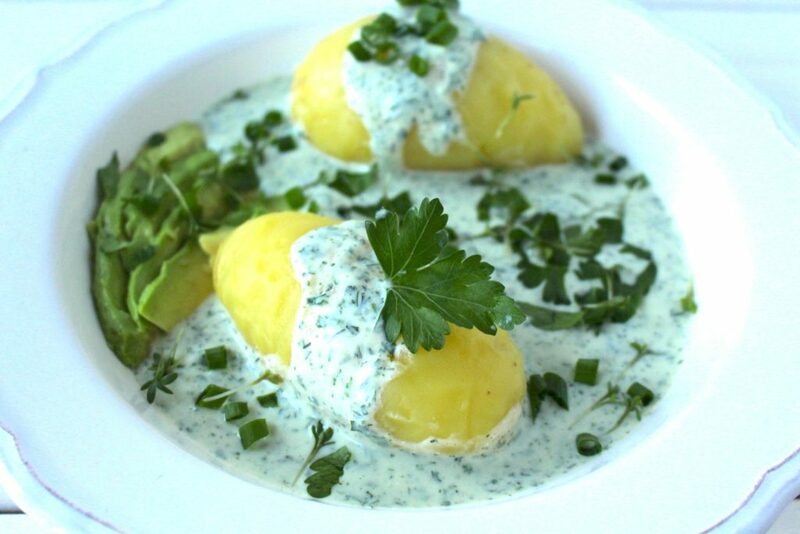 Traditionally this green sauce is served cold with peeled boiled potatoes and often with hardboiled eggs. As this is a plant-based recipe, we’ll just add some avocado stripes instead of the eggs. I once read that you should mince the herbs by hand instead of letting a food processor do the work. However, I never found a plausible explanation for this statement, so I recommend to just do it as you like. I for one prefer mincing them by hand, because this way I don’t have to wash my food processor. With this simple recipe for Frankfurter green sauce you can make a delicious vegan version of the traditional Hessian herb sauce. The original herb mix consists of chives, borage, pimpinella, chervil, sorrel, parsley and cress. Alternatively, you can add your favorite herbs to this spring dish though. Sort, wash and pat herbs dry (or use a salad spinner). Remove stalks and mince herbs (keep a few leaves for garnishing). 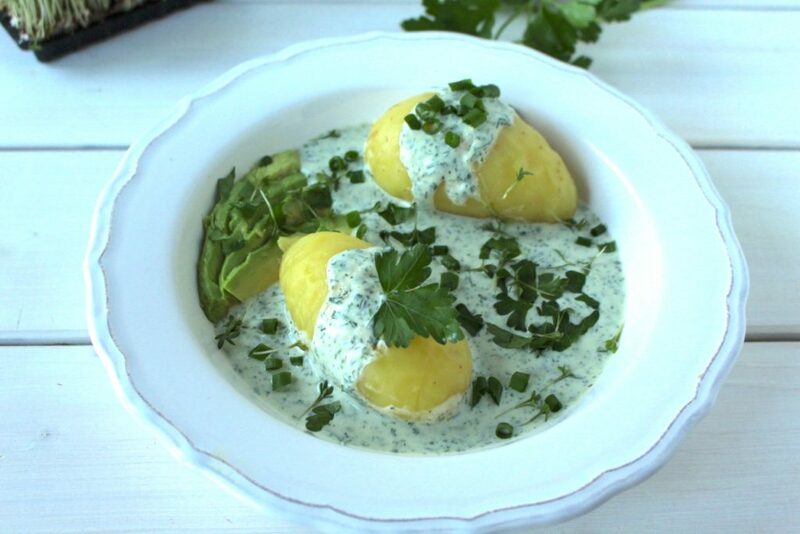 Mix together minced herbs with all the other ingredients and serve immediately with boiled potatoes (and avocado stripes) or chill in the fridge until serving. The original herb mix includes chives, borage, pimpinella, chervil, sorrel, parsley and cress. There's no need to follow the measurements strictly. If you don't want to mince the herbs, you could also mix everything together in a food processor. You should make this recipe with the best cashew sour cream. I hope you love this recipe – please let me know in the comment section below! If you make this green sauce, make sure to take a photo and share it on my Facebook page or on Instagram, using the hashtag #minamadefood. Oh and don’t forget to tag me (@thisisminamade) so that I can see your creations!